This large format rotary trimmer is seen in engineering departments around the world. They quickly and effortlessly cut large workpieces to size. Features include ground upper and lower blades along with an automatic clamp. As with all DAHLE Rotary Trimmers, safety is ensured by totally enclosing the blade in a plastic housing. 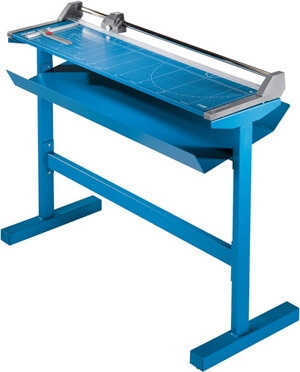 Cut Length 37-1/2", Capacity is 14 sheets, and Table Size of 45-1/2" x 12-1/2".